Ammirate l'aspra bellezza di Milford Sound dall'acqua in questo tour in pullman di lusso di un'intera giornata con una crociera da Queenstown. Viaggia attraverso la campagna neozelandese in pullman con l'aria condizionata come guida per far luce sulla flora e la fauna della regione. Metti in pausa la rotta per fermare le foto e scatta belle vedute sulle cime e le foreste. Durante la tua crociera a Milford Sound, ammira le possenti cascate che si infrangono sulle alte scogliere e osserva le onde per delfini, pinguini e foche. A bordo è previsto un semplice pranzo al sacco. I was very pleased with the tour which ended at 6:30 PM and was very relaxed. We even watched the movie on the way back. The driver was very professional and helpful. Coach driver was very pleasant and lovely which made me comfortable the whole trip with him. some stops were very rush of time but it was understandable because Milford Sound is the ultimate destination. Overall, the tour was good. We liked the tour guide's explanation on our way to Milford Sound as well as the scenery. We stopped on a few beautiful places along the way. However, there were some hiccups for the pickup location. As according to the customer service staff, we supposed to be picked up at the nearest bus stop to the AJ bungy at 6.45am but we could not see the bus. therefore, we walked towards Athol St. As we could not see our bus after the timing mentioned, we decided to call the customer service staff again and explained our situation. 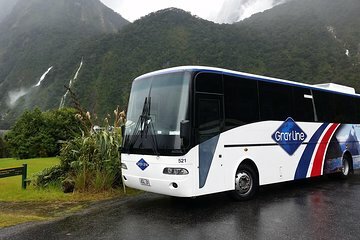 The customer service staff promptly made arrangement to board us on another bus and at Te Anau, we managed to catch up with our original bus. It is advisable to check correctly with the customer service staff and confirmed the pick up location name. The tour was really great and we loved all the stops made for scenery. The ride, however, was scary and the driver went pretty fast on windy hill roads. It's a bit long of a busride, but totally worth it. The Captain of the boat took us under a couple of the falls and even filled a bucket with water from one of them so you could see and taste the water fresh off the fjords. One of the best parts about this trip is definitely our driver! He introduces everything about Queenstown and NZ to us, plays us enjoyable music and movie, and sings for us! Scenery at mirror lake and Milford Sound is extraordinary. However, the drive takes about 4hours heading to Milford Sound and another 4hours to return. I would recommend a helicopter arrangement if you have the budget - so you do not waste too much time on transportation.